Travel to Palawan by air has now reached 22 flights a day in Puerto Princesa Airport only. That’s almost one flight every hour compared to one flight trice a week 25 years ago, and only coming from Manila. That’s ease enough to note. Because today you can reach Palawan, through Puerto Princesa, from Cebu, Davao, Ilo-ilo and Manila by four major airlines; Philippine Airlines (PAL), Cebu Pacific Air, Zest Air, and Air Philippines or PAL Express. You can also fly straight from Manila to El Nido via Island Transvoyager Inc. (ITI), with three flights daily. And/or Busuanga, and Coron from Manila via Zest Air, Cebu Pacific and PAL Express. You can get their flight schedules in their corresponding Websites. Before coming in here let’s have a little bit of travel to Palawan geography, not the google map way but the old school way. With focus on four major legal entry places to Palawan. The following four entry points are also the province’s top mainstream tourists destinations. I mentioned legal entry because there is one illegal route, that is from Sabah, Malaysia to the islands down south of the municipality of Balabac, Palawan. I’m not recommending it of course. FYI only. Puerto Princesa is one of the 38 independent cities in the Philippines. Although it sits almost at the center of the elongated main island of the Province of Palawan, the provincial government has no control over it. If you’re planning to explore all of the province’s tourists destinations then the best entry point for your travel to Palawan is through Puerto Princesa city. 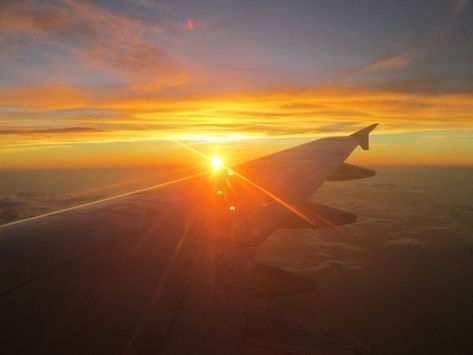 Flights to Puerto Princesa brings you to the heart of the city itself. The City alone deserves two nights and 3 days worth of mainstream tour time to be able to see the main tourists sites. With the famous Underground River or the New 7 Wonders of Nature as the highlight of your tour. And from there you can choose whether to go South or North and to the Island municipalities. 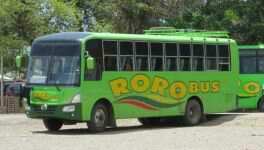 In going north take the Portwally Van co., Lexus vans, and the RoRo Bus Line. Or, Rent a motor bike at P400 -P500 rent per day (24 hrs). You can take it anywhere you want within the mainland. So to fill your travel list to Palawan here’s an introduction, since each of them needs a page of its own, the South side of Palawan. Meet the following municipalities and its estimated travel time from Puerto Princesa City. 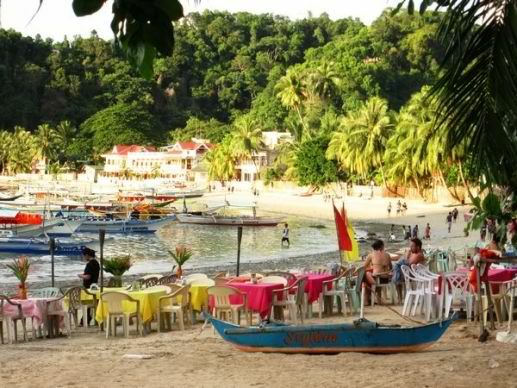 Aborlan (1 hr) – Princesa Holiday Resort at Barangay Tigman offers a 3-kilometer white sand beach. Narra – (2 hrs) home to the Philippine Cockatoo in Rasa Island, which is now endangered because of the planned coal-fired power plant. Narra is known as the rice granary of Palawan. Quezon (3 hrs) – South West, where Tabon man once lived around 24,000 years ago in Tabon Cave. Shares jurisdiction to Mt. Matalingahan Protected Landscape. Rizal (4 hrs) – South West and shares jurisdiction to Mt. Matalingahan Protected Landscape. Sofrono Espanola (3 hrs) – home to Indigenous People, Muslims and Christians, a Tri-people cooperative exists here. I once worked with them three years ago on water filter technology, the Bio-Sand Filter. Brooke’s Point (4 hrs) – Orchard Farms, Coconut Farms, Mountain Resort. Also shares jurisdiction to Mt. Matalingahan Protected Landscape. Bataraza (5 hrs)- host of Ursula Island, a roosting place for migratory birds. 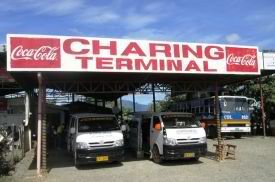 Located in the southern tip of main land Palawan. Balabac (Since its an Island municipality you’d have to take a boat from Rio Tuba, Bataraza which takes 5 hours of travel time) – Balabac consist of 31 islands and islets. A Century old Melville lighthouse can be found here, guiding huge ships passing by Balabac Strait. Home to some Palawan endemic species; mouse deer, locally known as Pilandok, and the bearded pig. There are Travel and Tour Services that can arrange customized alternative type of tourism for you. When done, you always have to go back to Puerto Princesa, and from there you’re now ready to explore the northern part of the province. Roxas (2 hrs) – Roxas town used to be a Silica mine site. if you’re interested in seaweeds farming there’s Green Island for that, apart from swimming and beautiful beach views and sunsets. Former Coco Loco island is now Modessa Island Resort. Taytay (4 hrs) – la Estrella del Norte or the Star of the North is blessed with a fish bowl, the Malampaya Sound. Taytay is host to several marine sanctuaries and reserves; Tecas Reef Marine Park and Fish Sanctuary, Isla Blanca and Quimbadulan Marine Reserves, and Apulit Island Marine Sanctuary. The municipality covers east and west coastline of Palawan. If you stop over here I recommend you stay and eat at Casa Rosa. It is located up hill and offers a beautiful view of Taytay bay and Fort Santa Isabelle of the Spanish era. Or stay at Apulit Island Resort, formerly Club Noah Isabelle. San Vicente (3.5 hrs) – north western part of Palawan, known for its 14-kilomerter white sand beach. It is now being groomed as the next Boracay. Also in San Vicente is Port Barton, a laid back tourist destination where you can enjoy a lot of nature than luxurious hotels. The coming of dusk in El Nido town. El Nido is one of the 16 mainland Palawan municipalities covering 45 stunningly beautiful nature-crafted limestone islands and islets. The municipal town is located in the northeastern tip of mainland Palawan, approximately 238 kilometers from Puerto Princesa city or approximately 6 hours of travel tine. During your travel to Palawan, you’ll enjoy the uniqueness of El Nido’s landscape and seascape together with its wide range of endemic flora and fauna. Such exceptional characteristics of El Nido made the whole municipality of 18 Barangays declared as a Protected Area. The El Nido -Taytay (3 barangays) Managed Resource Protected Area (ENTRMRPA) was proclaimed in October 1998. El Nido’s gorgeous island views were featured in the Jeremy Renner movie, The Bourne Legacy. If the slum areas of Manila was mentioned as the “Gate to Hell” in Dan Brown’s book Inferno, then El Nido is your gate to heaven. Flying directly from Manila to El Nido is already a complete package of your travel to Palawan. While in El Nido, you can experience both terrestrial trekking to deep sea diving adventures and a lots of beach activities. The one big thing you will miss by skipping Puerto Princesa is the Underground River and other caving adventures. Coron and Busuanga are island municipalities occupying the island of Busuanga. And Busuanga Island belongs to the Calamian group of islands located between the North Eastern Tip of Palawan mainland and the Province of Mindoro. Coron as a municipality covers the eastern part of Busuanga. It should not be confused as Coron Island. 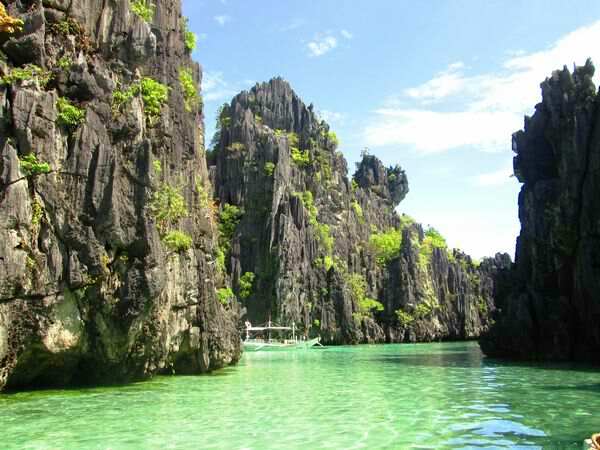 It is because Coron Island is the 3rd largest in the Calamian group of Islands, belonging to the municipality of Coron. 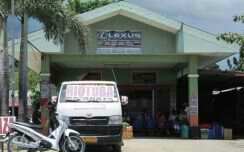 The municipality of Coron does not have an airport but the municipality of Busuanga has. In order to reach Coron and Coron Island you have to fly from Manila to Busuanga or take a 12-hour boat ride (WG&A Superferry) from Manila or from Puerto Princesa City. The Superferry docks near the town center of municipality of Coron. So how do you go from one place to another? Like back and forth Coron and Busuanga is just a 45-minute ride by land. You have a choice of taking a bus or a van. The challenging part is going to El Nido from Coron or Busuanga? Challenging because, the Calamianes is located in between the rough open seas of South China Sea and Sulu Sea. Unless you are a sea fairer, then you are going to be fine. A friend of ours, Patrick, traveled alone from Ulugan Bay to Port Barton and El Nido with a paddleboat for a week. Well, some back packers take the El Nido – Coron or Coron El Nido route as part of the adventure. However, it is much easier to go back to Puerto Princesa via WG&A Superferry then proceed to El Nido by land if you entered Palawan via Busuanga/Coron. However, before I go further swimming in the Calamian, let us know the Calamianes or Calamian group of islands first. This way, you can decide where to go first on your travel to Palawan itinerary. After some research, I think no one ever counted the islands in the Calamian. Anyways, here are some of them to hop during your travel to Palawan. The spectacular Calamian group of Islands landscape and seascape is almost similar to El Nido. Culion Island (Island Municipality) Site of historical Leper Colony. Calauit Island (Game Preserve and Wildlife Sanctuary) within the political jurisdiction of Busuanga. Home to some African wildlife. and more, comprising more or less 100 islands and islets. So, have you decided on your travel to Palawan route yet?